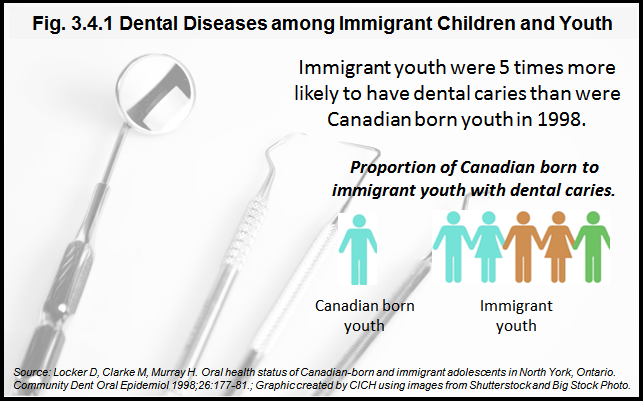 Evidence indicates that immigrant youth are at greater risk of having dental disease – in fact they were five times more likely to have dental caries than were Canadian born youth. One in five immigrant youth required restorative dental care for these caries – compared to less than 4% of Canadian born youth.1 While the longer immigrant children and youth live in Canada, the less likely they are to have dental disease, they continue to have higher rates than Canadian born young people. Poor oral health among immigrant children and youth may result from poor nutrition and diet, lack of fluoridated water, poor dental hygiene practices and limited dental care in the past. This is particularly true for refugee children and youth who are less likely than children and youth from other immigrant classes to have received dental care in the native countries. 1Locker D, Clarke M, Murray H. Oral health status of Canadian-born and immigrant adolescents in North York, Ontario. Community Dent Oral Epidemiol 1998;26:177-81. Cited in Pottie K, Greenaway C, Feightner J, et al. Evidence-based clinical guidelines for immigrants and refugees. CMAJ 2011;183:E824-925. Children and youth arriving from countries with limited dental care and where diets are high in sugar are at the highest risk for dental disease. Screening and referral for dental disease can facilitate treatment and prevention. Patients are twice as likely to go for dental treatment when they are actively examined and referred by a physician. Tooth-brushing twice daily with fluoridated toothpaste is effective in reducing the risk of dental decay.